Registered guests of Frontier Town and Fort Whaley enjoy free access to the Water Park and a special discount to the Mini-Golf Course! Registered guests of Castaways enjoy a special discount to the Water Park and Mini-Golf Course! 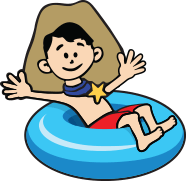 *The Frontier Town Water Park will be open from May 25 – September 2, 2019 only. Post Labor Day, the Water Park will be closed for construction. We were hoping to keep it open on Saturdays this September and we do apologize for any inconvenience this change may cause to your plans.